One of the distinctive traits of each letter by Saint Paul is his pattern of emphasizing some significant aspect of the mystery of Christ and showing the correlative trait that ought to be found in His followers. In the Letter to the Philippians his theme is Christ’s humility and our need to imitate His humility. The letter begins in prayer for the Christians at Philippi, a city of Thrace (north-eastern Greece) that Paul visited on his second missionary journey between 50 and 52 A.D. and then again during this trip journey between 53 and 58 A.D. After a greeting (1:1-2), Paul is effusive in his thanks for the way in which the Philippians have embraced the Gospel (1:3-5) and been generous in supporting him (4:14-18). Accordingly he prays that God, who began such good work among them, will bring it to completion in Christ (1:6) and supply their every need (4:19). There is much that is quite personal in this letter. We read, for instance, of Paul’s Pharisee heritage (3:5), his yearning to visit the brethren at Philippi (1:8), and the success of his witness to Christ even among the praetorian guard during his imprisonment (1:12-14). We hear of his hope to send Timothy to them (2:19-24) and his plea that Eudoia and Synteche come to agreement with one another in the Lord (4:2). The Christology found in this document (2: 5-11) is unique among the various approaches to the mystery of Christ that Paul displays in his letters. Often called a kenotic Christology (from the Greek word kenosis, “emptying”), the central idea here is that in the Incarnation the Eternal Word of God “emptied himself” by taking the form of a servant rather than clinging to the equality with God the Father that was his by right. This passage is in the form of a short hymn that Paul incorporates into his Letter as something from the liturgy of the Church in ancient Philippi. Before we turn to Paul’s account of how Christians are to imitate Christ’s humility, there is much of theological significance that deserves careful comment. The scholarly terminology current nowadays would label the Christology operative here “a descending high Christology” because this Letter explicitly asserts that the one who takes on a human nature has equality with the Father (2:6) and that he descends to the level of human beings by taking our form and adopting the status of a servant (2:7). By contrast, scholars use the term “an ascending low Christology” to characterize those writings in which Jesus is taken to be given divine honors only after doing various deeds or in which the mystery of Christ’s being is only gradually disclosed to be divine. There is nothing of the sort here, for this Letter formally recognizes his equality with the Father from its start and praises the generosity that is shown by taking on a full human nature and not clinging to what he has by virtue of his divine nature. In this divine self-sacrifice he shows his complete obedience to the will of the Father, even to the point of a painful bodily death by crucifixion. On account of this perfect humility, the Father has exalted his human name (“Jesus”) and joined to it the title of “Lord,” that is, Kyrios, the word that throughout the Greek version of the Old Testament translates the special Hebrew term Adonai that reverent Jews always substitute for the sacred and unpronounceable name of God (YHWH). The hymn thus closes by acclaiming Jesus Christ as Lord. We have in this text the source for our Christian liturgical practice of bowing at the name Jesus (2:10). It is one of the premier textual sources for the proclamation of the divinity of Jesus in all Christian creeds (2:11). From this emphasis on the humility of Christ Paul draws the implication that Christians are to imitate him by their own practice of humility. 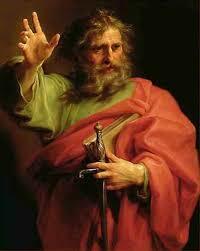 Because he took on the form of a servant, Paul and Timothy call themselves his servants (1:1). Fully aware that his imprisonment may lead to his death, Paul can assert: “For to me, to live is Christ and to die is gain” (1:21). His prayer for the Philippians is that they may practice a similar humility: “Only let your manner of life be worthy of the Gospel of Christ, so that whether I come and see you or am absent, I may hear of you that you stand firm in one spirit, with one mind, striving side by side for the faith of the Gospel, and not be frightened in anything by your opponents” (1:27-28). It would be understandable for a certain pride to creep in among those who successfully undertake difficult tasks, such as giving faithful witness to Christ in the face of persecution. Perhaps it is this that explains the way in which the Christological hymn that is at the center of Paul’s message in this Letter is introduced by a similar call for humility: “Do nothing from selfishness or conceit, but in humility count others better than yourselves. Let each of you look not only to his own interests, but also to the interests of others. Have this in mind among yourselves, which was in Christ Jesus, who though he was in the form of God…” (2: 3-5). It is Christ’s own humility that should set the pattern for the conduct of his followers. For Saint Paul, the sort of humility that is required is never mere sentimentality, and it is certainly not the cowardly lack of spirit that later anti-Christians like Nietzsche liked to ridicule Christian meekness. Among the considerable range of practical applications that Paul envisions for Christian humility, Paul includes not only the need to avoid grumbling but also the need to prepare oneself for martyrdom: “Do all things without grumbling or questioning, that you may be blameless and innocent, children of God without blemish in the midst of a crooked and perverse generation, among you you shine as lights in the world, holding fast the word of life, so that in the day of Christ I may be proud that I did not run in vain or labor in vain” (2: 14-16). A final aspect of Paul’s insistence on the need to imitate the humility of Christ is his recognition that this imitation is a life-long process and not the work of a single day or a single deed. After admitting how much his conversion to Christ cost him (3:2-6), he resiliently insists that nothing that he once possessed and then lost can compare with what he has gained by knowing Christ (3:8). Of special importance for us as we read this Letter and aim to make his practice our own is his sense that maturation in Christ needs to be our whole life’s work: “Not that I have already obtained this or am already perfect, but I press on to make it my own, because Christ Jesus has made me his own…. Forgetting what lies behind and straining to what lies ahead, I press on toward the goal for the prize of the upward call of God in Christ Jesus…. Brethren, join in imitating me and mark those who so walk as you have an example in us” (4:12-17). Father Joseph W. Koterski, S.J. is a Professor in the Philosophy Department at Fordham University, in the Bronx, New York.